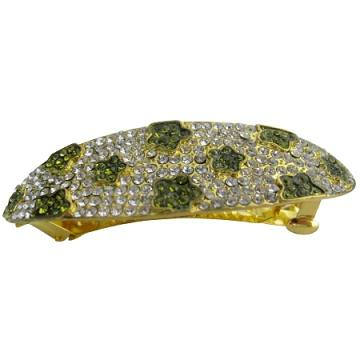 The Gold metal hair barrette fully encrusted clear Crystals with peridot Crystals flower embedded & decorated hair clip generously simmulated diamond throughout the hair clip encrusted ! !.Add pizzazz to your hairstyle with the latest craze in hair jewelry! These sparkling Crystals are dazzling catching every color & light ray & adding just the right touch to your evening or formal occasion. The uses for this item is endless!. Buy Bridesmaid Wedding Hair Barrette Clear Crystals Peridot Flower Clip , sold & shipped by Fashion Jewelry For Everyone where you can shop online for Leading Online Retailer for Indian Fashion Jewelry. This Brooch, Pins & Bands collection has been tagged as Wedding Barrette,Hair Barrette,Hair Clip,Clear Crystals,Crystals Barrette,Crystals Clip,Peridot Crystals,Peridot Flower,Flower Barrette,Flower Clip,Bridesmaid,Wedding,Hair,Barrette,Clear,Crystals,Peridot,Flower,Clip,Wedding Hair Barrette,.